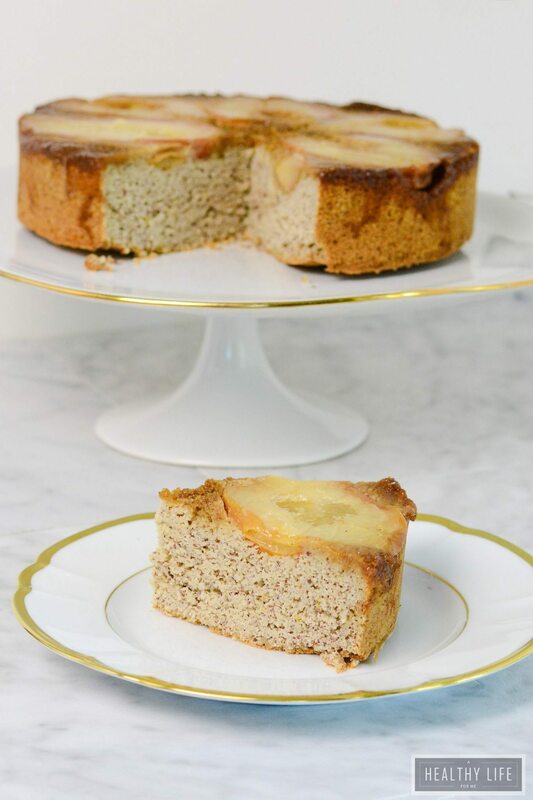 Gluten Free Pear Upside Down Cake is a beautiful, dense, moist, nutty flavored cake that is flavored with the juice of Bosc pears. Gluten Free, Dairy Free, Paleo friendly and Vegetarian recipe. Several years ago I planted a small fruit tree orchard in our backyard. I planted four apples, four pears, four peach and four cherry trees. All the trees did well for the first few years but have been hit or miss on the size of their production since then. That is except for my pear trees. I consistently get a good harvest, sometimes more than one girl can handle. I mean really how many pears can a family eat. So I look for ways to enjoy them besides as mid-day snack. I give some away, preserve some and bake with the rest. Hence why you are seeing an upside down pear cake. 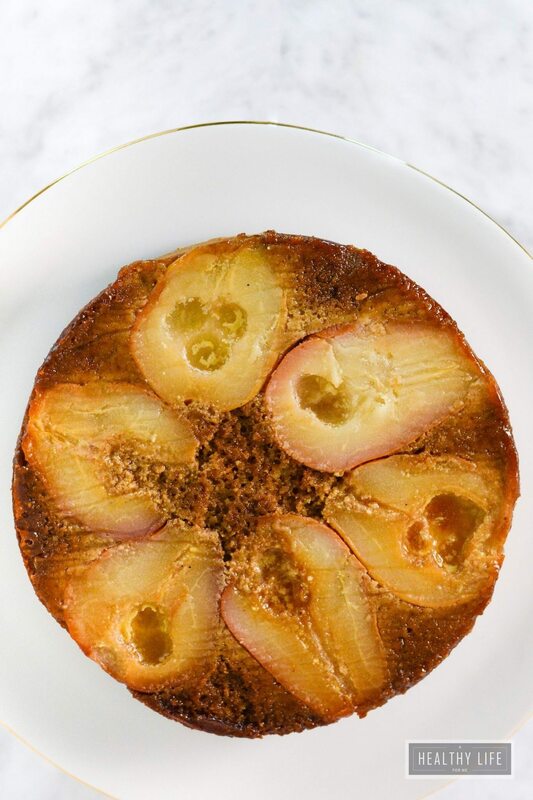 Pears are such a sweet juicy fruit that they help make a moist cake that is flavored with all that wonderful pear juice. Giving the pears a quick poach helps to release their juices and add flavor to the caramelized topping of orange juice, maple syrup, and coconut sugar. 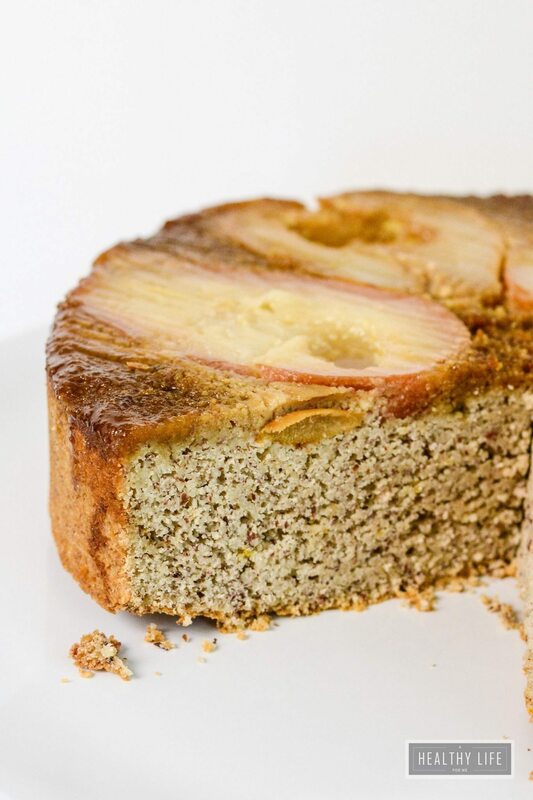 Not only is this cake made with nut flours which increase the % of protein and fiber. Of course, those sweet delicious pears are one of the highest fiber fruits. A diet high in fiber can also keep your cholesterol levels down, which is good news for your ticker. Getting your fill of fiber from fruit is also linked to a reduced risk of breast cancer, heart disease, and type 2 diabetes. What is your favorite way to enjoy pears? Preheat oven to 350?. Butter a 10″-diameter cake pan and line bottom with a parchment paper round; flour sides of pan. Cook orange juice, maple syrup,cup coconut sugar, and palm shortening in a medium skillet over medium heat, stirring, until sugar is dissolved and mixture is slightly reduced, about 2-3 minutes. Add pears, cut side up, and cook (undisturbed) until they begin to release their juices, about 2-3 minutes. Turn pears over and cook just until slightly softened, about 2-3 minutes. Transfer pears to prepared pan, cut side down. Return skillet to medium heat and cook liquid in skillet until thickened and syrupy, about 2-3 minutes, depending on juiciness of pears. Pour syrup over pears and place pan in freezer to help quicken the set of the syrup. Just the time that it takes you to prepare batter. In a medium bowl, whisk together flours, baking powder, baking soda, salt, cinnamon and cardamom. Set aside. In a small bowl, whisk together maple syrup, eggs, coconut cream, coconut oil, and vanilla extract. Add the coconut cream mixture all at once to the dry ingredients. Stir until just combined and no lumps remain. Spoon batter into the prepared pan over pears. Bake for 45-50 minutes, or until a skewer inserted in the center of the cake comes out clean. Allow cake to cool to room temperature before removing from pan. Looks amazing! 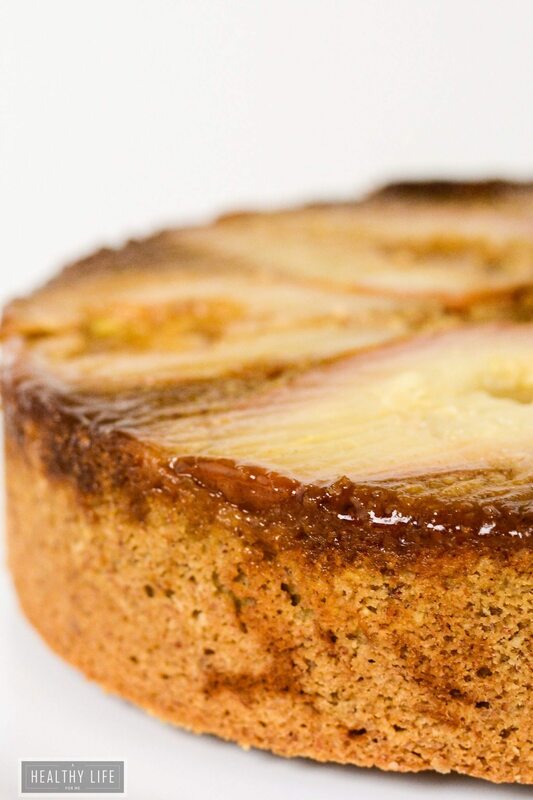 I have tried apple and plum upside down cakes but haven’t tried pear! I love that you planted an orchard! Sounds incredible. Are they sour cherries I wonder? Because they are my favorite but so fleeting! I love the idea of this cake and that you made it with nut flours. I am sure the combination of the nuts and silky poached pears is simply heady! Love! Pears make the perfect fall dessert. I love that this cake is gluten free and it looks like the perfect treat for breakfast or dessert! How awesome is that? My SIL grew up with a pear tree and she used to can the pears with her mom! This is absolutely stunning. I have some GF family members that I cannot wait to make this for! Thanks Kimberly Ann, I hope they love it as much as we did! I saw this on Facebook and swooned! I feel pears don’t get the love that apples do during autumn, but I really love working with them (and in desserts they are so good!) I actually added pears to my cranberry sauce this year. Oh this looks amazing! Love the use of pears, they’re my favorite! I hope to one day have a piece of land with some fruit trees on it ???? This recipe looks delicious and it’s gluten free too ???? pinning for later. This cake looks amazing. I have all the ingredients to make this. Can I use coconut oil instead of palm shortening? Yes Christine, you can use coconut oil. Enjoy! I’m so jealous you have your own pear trees – what a wonderful source for delicious fruit and amazing new recipe ideas! And I just love the extra nutrition woven into this lovely gluten-free cake, thanks to the nut flours. Such a decadent, yet so much more nutritious, dessert for autumn! I LOVE upside down cakes, and always thought poor pears were underappreciated despite being such a sweet, juicy and flavourful fruit. So perfect pairing in my book! And I love how airy the cake is. Such a great dilemma to have. . .what to do with so many pears? I’m wishing that I had all those fruit trees in my yard. But such wishes will remain just that when you live in the concrete jungle. Fortunately there are several good orchards a car ride away. . .and in a pinch. . .there is always Whole Foods. . .which means I don’t have to go another day without this beauty in my life. It looks absolutely stunning. . .and all the more special knowing that those pears were fruits of your labor. How incredibly pretty! Bosc are always my fave because I don’t have to sit around waiting for them to ripen. So lovely! I love all the orange and maple flavors in this cake. Delicious for fall! Thanks Steph! Perfect way to enjoy all those fall flavors. This looks so amazing! I haven’t made a whole cake in a longggg time, but I seriously want to give this one a try. Pinning! Thanks for the pin, Giselle.